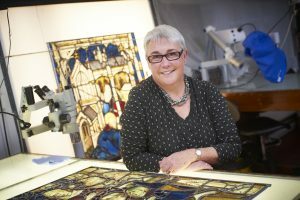 With one of the biggest conservation and restoration projects of its kind now complete, we caught up with Sarah Brown, Director of York Glaziers Trust, to talk about the Trust’s work over the last decade on the country’s largest medieval stained glass window. The Great East Window has dominated York Minster’s East End for 600 years, with millions of people marvelling at its majesty over the centuries. 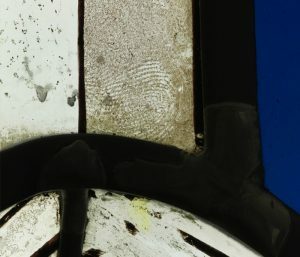 But few have had the opportunity to study its content at close quarters, to develop our understanding of the story it tells or to uncover evidence of its creators, including the fingerprints of the original glaziers preserved in the glass. So, for even the most experienced expert at York Glaziers Trust (YGT), the chance to work on the internationally renowned stained glass window has been a unique career highlight. The Trust’s involvement started as early as 2005, when the need for extensive work on the East End’s stone and glass first emerged. At the time, Sarah Brown was a trustee of York Glaziers Trust, becoming its Director in 2008. “It was such an enormous project and so demanding that it was clear that, to complete it to its full potential, it was going to need a remarkable mix of skills,” she explained. At the start of the project, only basic details were known about the window’s history. Material from the Minster’s archives showed it had been created by master glazier John Thornton, of Coventry, between 1405 and 1408, and that he was paid £56 for his part in its completion. The window depicts the beginning and end of all things, from the Book of Genesis to the Apocalypse, but little was known about the window’s story, and the biblical sources and medieval vision it represents. “It has become clear during the project that its extraordinary monumentality was always taken into account by its creators – it was always meant to be read from the floor of the cathedral,” Sarah explains. Other hidden details about the window’s creation were also discovered when conservators began examining the glass. “I think we all found it thrilling when we started to find little scraps of physical evidence of the people who had been working on the window originally – fingerprints in the paint and marks left from filaments of clothing when it had been fired in the kiln,” Sarah added. “It connected you with the people who, like you, had been working on the window centuries before. But the project has not just involved preserving the window’s history, it’s also required the team to devise new ways to protect its future through a new, state-of-the-art protective glazing system. The solution chosen was a new UV resistant, hand-blown glass manufactured by Glasshϋtte Lamberts in Germany. The cathedral was the first building in the UK to use the glass, with the widest worldwide use to date. The Trust’s work on the project has been far reaching. As well as the conservation aspects, the team has worked with art historians, surveyors and members of the clergy to understand the history of the window and the narrative it tells. The funding from the Heritage Lottery Fund allowed it to open the Bedern Glaziers Studio where members of the public could see and speak with conservators working on the 600-year-old glass. Other opportunities have included developing its work and systems for monitoring the glass, its photography to record the panels and training new staff including five apprenticeships which were created during the project. So, with the project finally drawing to a close after more than a decade, how does it feel to see the finished window? “It’s undoubtedly been a career highlight working on such wonderful glass. There’s no debate – the Great East Window is up there as an international work of art and we all feel immensely privileged to have been part of it,” Sarah explains. “At the time we were working on the panels we could see how marvellous they were, but what we couldn’t judge was the impact when they were returned to the building – it looks wonderful and I’m thrilled. Sarah Brown’s new book, The Great East Window of York Minster – An English Masterpiece, will be available to purchase from the York Minster Shop from mid-May 2018.